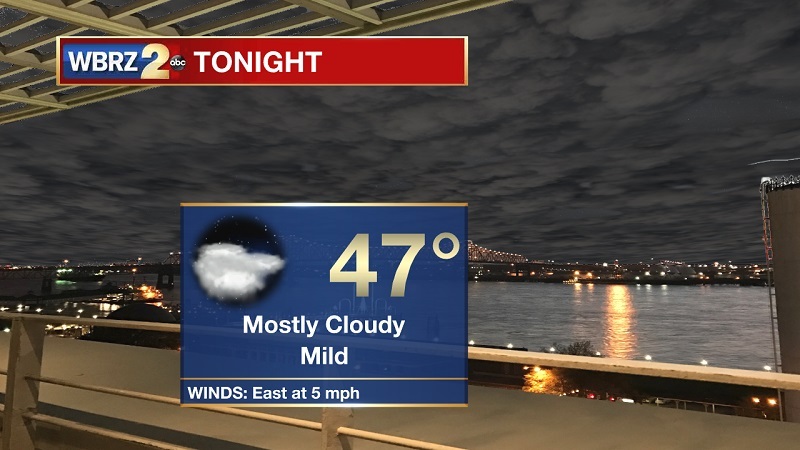 Tonight and Tomorrow: Mostly cloudy skies set to continue though the evening and into Sunday, helping to keep temperatures slowly cooling near 47° overnight. Winds will stay light and will slowly shift easterly to southeasterly as we head into Sunday morning. The addition of a more southerly wind component will allow for warmer temperatures on Sunday, as highs hover around 69° through the early afternoon hours. A very weak warm front will move onshore from the Gulf, keeping clouds overhead and allowing for some pockets of drizzle through the afternoon and evening hours. The best chance of experiencing a passing spritz will be along the coast and south of the I-10 corridor. Up Next: Showers poised to increase through the early part of the workweek, peaking overnight Monday into Tuesday. Some strong thunderstorms are possible early Tuesday, but clouds will break through the late morning and early afternoon. A brief dry spell will occur on Wednesday before showers return Thursday and Friday. 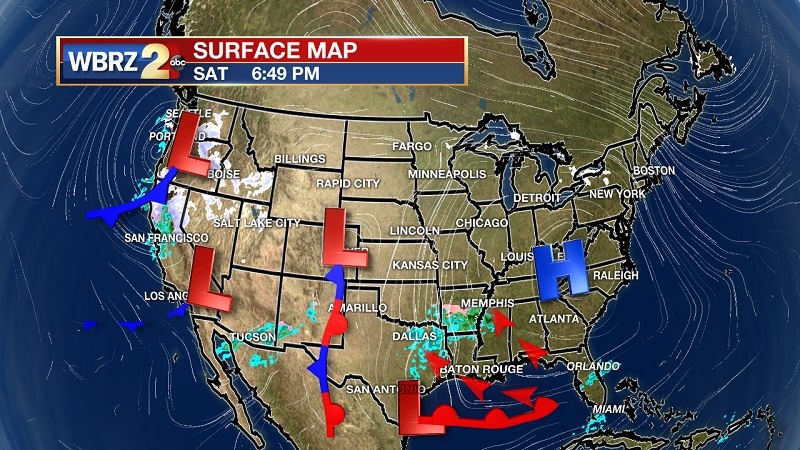 High pressure moving along the Eastern Seaboard and a weak low pressure system off the southern coast of Texas will be keeping clouds in the forecast and set to increase atmospheric moisture Sunday and into Monday. This will also result in warming temperatures, as highs break into the upper 60s Sunday and mid-70s on Monday. These conditions will also work in tandem with an approaching frontal system that will begin to increase rain chances through the day on Monday. The front will be passing through South Louisiana and Southwest Mississippi overnight Monday into Tuesday, providing heavy rain and strong storms mainly early Tuesday morning. Luckily, this system is passing overnight, which will keep the storms from gaining severe status, due to the lack of instability and directional shear. Clouds will be breaking quickly through the day on Tuesday, as temperatures cool into the low 40s Tuesday night into Wednesday morning. High pressure briefly moves in on Wednesday, keeping us sunny and dry. These conditions will not last long, as another, more ragged system brings rain back through our area Thursday and Friday. High temperatures will again bob up into the low 70s on Thursday, before dropping to near 60° on Saturday.